Good location, many restaurants and supermarkets near, near metro station. Comfy place. Events every day. The location is pretty good. It’s only 5 minutes by walk from the beach and you have everything you need around, like subway, restaurants, bars. 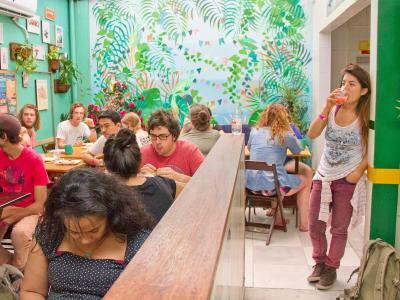 As a solo traveler, El Misti Hostel Rio Copacabana was a wonderful stay. The staff members were friendly and helpful. They are a wealth of information. 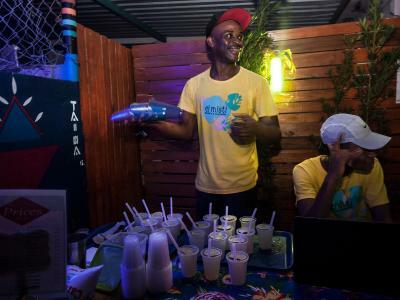 They have a decent happy hour in the evenings with delicious caipirinhas. 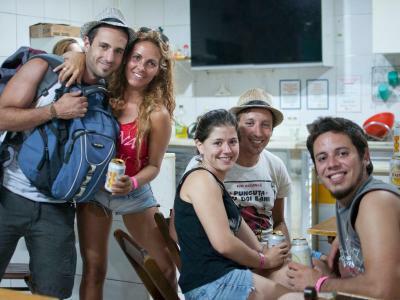 It's a great time to meet other fellow travelers. They also have fridges stocked with water and a nice selection of beer. They have a cozy little area at the entrance where you can smoke cigarettes. I booked my own room. It was clean and comfortable. The ac worked, but it was cool enough most nights I just propped open the window. It's also common only to use the ac during the night. The location was ideal. The metro is located directly across the hostel. Taxis pass by regularly. There are plenty of restaurants, shops, and ATMs within walking distance. Copacabana Beach is a short 20 minute walk (I'm a slow walker). Home made bread and cake. Fresh juice custom eggs. Really nice for Breakfast! Absolutely the very best staff anywhere! The staffs are just amazing. Loving people speaking English very well. Very friendly staff, nice location. I can recommend it! One of our best sellers in Rio de Janeiro! 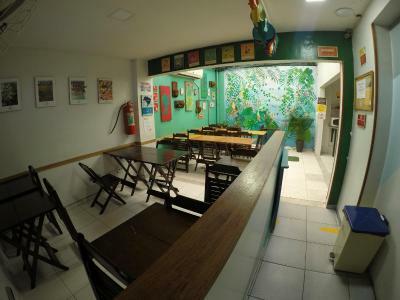 El Misti Hostel Rio Copacabana is located in front of Siqueira Subway Station and the bus stop. 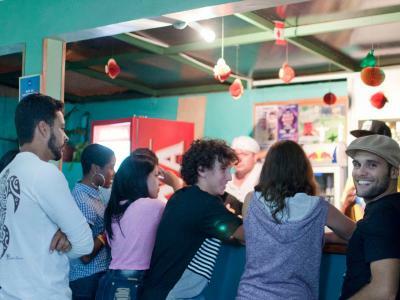 This hostel offers breakfast and air-conditioned dormitories. The tour desk arranges city tours and capoeira lessons. Wi-Fi is free. 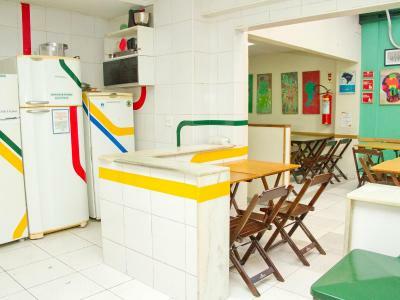 El Misti Hostel Rio Copacabana offers practical dormitories that have private lockers and a shared bathroom fitted with a shower. 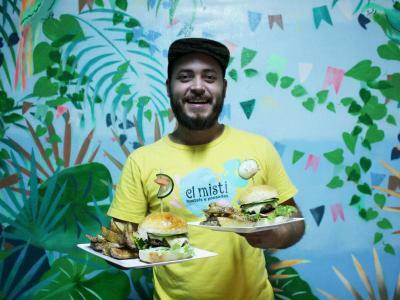 El Misti hostel offers a kitchen and an outdoor living area. 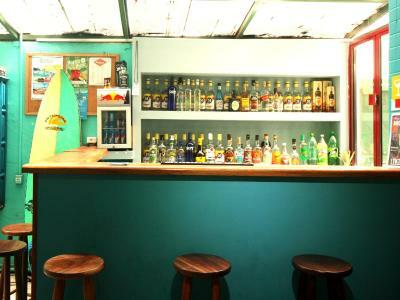 Guests can also have refreshing drink at the bar. 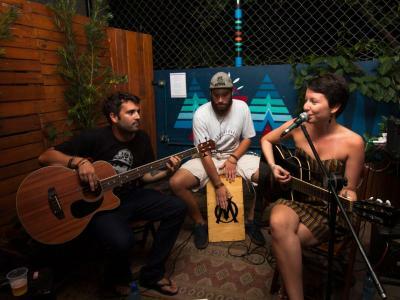 The front desk’s multi-lingual staff can arrange transfer to samba lessons, football matches and favela tours. They can arrange visits to Sugar Loaf Ridge and Christ the Redeemer Monument, which can be reached within a 20-minute drive. Bicycle rental is available. 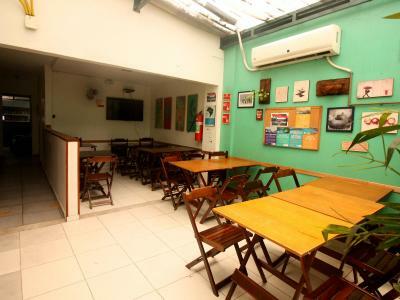 This hostel is 6 minutes- walk from Copacabana Beach and a 10-minute drive from Rio Sul Shopping Center. 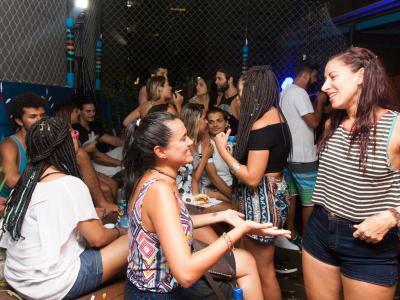 Rodrigo de Freitas Lagoon is 25- minute walk away from the hostel. Antonio Carlos Jobim International Airport can be reached within a 40-minute drive, and Novo Rio Bus Station is a 25-minute drive away. 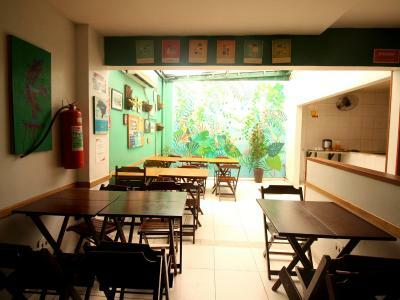 뀐 Located in the top-rated area in Rio de Janeiro, this property has an excellent location score of 9.0! 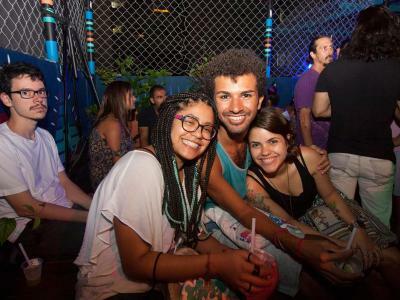 When would you like to stay at El Misti Hostel Rio Copacabana? This female-only dormitory room comes with air conditioning and a shared private bathroom. This mixed dormitory room comes equipped with air conditioning and has a shared bathroom. Towels and linens are available for a fee. This mixed dormitory room comes with air conditioning, bed linen and a shared private bathroom. Towels are available for a fee. 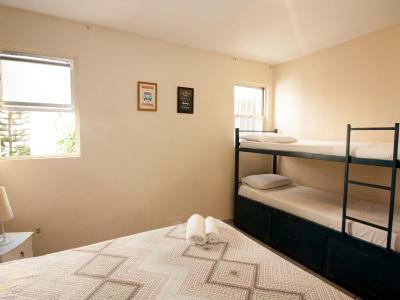 This mixed dormitory room comes with air conditioning and an en suite shared bathroom. Towels and linens are available for a fee. This private dormitory room comes equipped with air conditioning and has a shared bathroom. Towels and linens are included. This private room with two single beds comes equipped with air conditioning and has a shared bathroom. Towels and linens are included. This private room comes equipped with air conditioning and has a shared bathroom. Towels and linens are included. This private room comes equipped with air conditioning and has a shared bathroom. Towels and linens are included. Double beds and two single beds. This bed in dormitory features air conditioning and has a shared bathroom. Towels and linens are available for a fee. 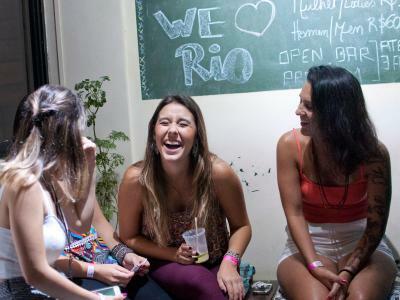 House Rules El Misti Hostel Rio Copacabana takes special requests – add in the next step! El Misti Hostel Rio Copacabana accepts these cards and reserves the right to temporarily hold an amount prior to arrival. The air condition is on from 9pm to 9am and then is very hot. Out air condition wasn’t working so good as other rooms. WiFi is not good at all, me and my friend couldn’t connect to the network for 24 hours while it worked for orhers. Dirty, loud music played at the reception till morning, noisy at night in general. Following some rules strictly but others not at all, that is when they feel like it. Some personal was very nice, some were simply arrogant. There were big electricity problems during more than 1 day, but there was no communication/apologies/compensation. Huge contrast with the very nice closed hostel el misti botafogo. Breakfast was ok. Location is perfect. Hostel itself not. The worst hostel I have ever stayed at. 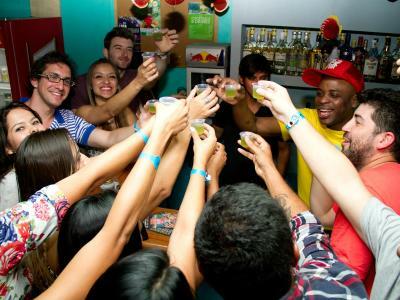 It’s a party hostel! It can be noisy, busy and not clean but you expect other things from party hostels. What I didn’t like was that there was no group activity arranged from the hostel even though we were there during the carnaval and the city had a lot of events to join. The location is great, next to the metro! Good vibe and energy. It's difficult to hang any wet clothes anywhere, the rooftop has a tiny clothes line but it was always full of sheets. It stormed most nights I was there so I had lots of wet clothes... 10 bed dorms are squishy! I had to wait until 2pm to check in even though there was only 1 other person in the 10 bed dorm, I arrived early and very tired, would have been nice to check in early as if didn't effect anyone. Great common area to meet people. Bar is good, although loud from the first floor rooms. Comfy beds, breakfast available for extra cost, fresh baked cake and bread! Awesome location, easy to get anywhere either walking or metro. Not too much space from one bed to the other nor space between the upper bed and the bed below. would be nice a swiming pool! 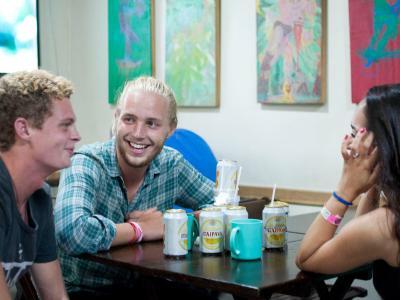 the hostel is good located and the staff are great people! good facilities, the room had private bathroom. good vibes! cheap and good located! 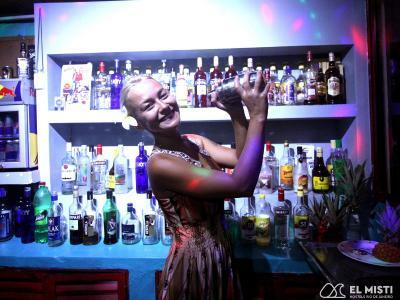 Wonderful staff & cocktails! Really social if you are travelling alone!